Paint Brush Covers Keep Brushes Happy! The key word in the title of this post is KEEP! Keeping paint brush covers is a concept that escapes most DIY painters. There is good reason to keep the cover. 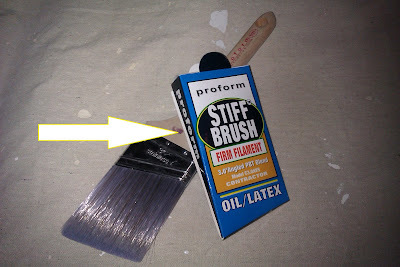 A brush cover is the packaging that came with the brush and is thought of as trash by do-it-yourself painters. In reality this cover should be kept. It is understandable why this cover is thought of as trash. The material is generally heavy card stock or waxed card stock and resembles packaging material. We have been trained from a young age to dispose of this packaging material on every other thing we have ever purchased. You cant blame DIY painters because they don't know any better. Keeping the cover on the brush from project to project while in storage will make your next painting project easier. This is a Brush Cover. The funny thing is that most DIY paint brushes found at ACE Hardware, Lowes and other home improvement stores have a much higher quality plastic cover with fancy clips and fasteners that will out last any other cover. This has always boggled us as professional paint brushes come in cheap card stock covers. Some of us have even resorted to buying these cheaper brushes just for the covers. That sounds crazy to most but the Pros will relate to that. After the brush has been properly cleaned and dried putting the brush back into its cover will help retain the shape of the bristles ensuring sharp lines next paint project. The cover makes it easier to store the brush. The bristles will not snag on things going in and out of a tool box or bucket. The cover makes it easier to identify the type of bush. There are hundreds of paint brushes out there and the cover makes them easier to identify especially after you have worn the identifying print off the handle. It makes you look PRO. Showing up with a cover on a brush makes a Home Owner feel like you are clean tidy and organized. Always a plus! If you are painting for a living keeping the cover will ensure future employment as your boss will probably fire you for being careless with tools.